The High Mileage Rewards Continue The more you Drive, the more you Save! Disclaimer: Don Valley North Toyota is a Division of Weins Canada Inc. All Offers subject to change or cancellation without prior notice. 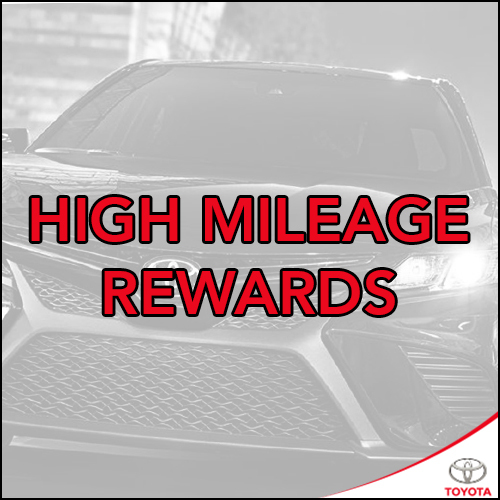 High Mileage Rewards *Receive 10%/15%/20% off parts and service when you service your Toyota or Scion vehicle with over 100,000km/ 150,000km/ 200,000km at Don Valley North Toyota between January 1st and March 31st, 2019. Not valid in conjunction on tire purchases, express lube oil changes, rustproofing inspections, Ontario Drive Clean Certification, safety inspections & over the counter part sales. Cannot be combined with Seniors Discounts, tire specials, or any other discount or special offer. Toyota and Scion vehicles only. Savings will be applied before sales tax on final Service RO subtotal. Offers subject to change or cancellation without notice. See Don Valley North Toyota for full details. Tire Storage Special *Tire storage regularly priced at $99.95 per season, one season of "tire storage" is for 6 months. Purchase 2 seasons of tire storage ($149.95 before HST) and save up to $50 off final price before taxes. Not valid in conjunction with other coupons, promotions or discounts. Offer expires January 31st, 2019. Applicable to Toyota and Scion only. See Don Valley North Toyota for more details. Tire Price Match Guarantee *Should you find a lower Canadian advertised price or Canadian internet quote on summer or all-season tires within thirty (30) days before or after the purchase of qualifying tires from a participating Canadian Toyota Dealer, present the Toyota dealer where you purchased or intend to purchase qualifying tires with proof of the Canadian advertised price or Canadian internet quote. They will verify the price and that the item is in stock and available for immediate sale and delivery, and then match the lower price. Canadian advertised or Canadian internet quotes are eligible from local tire retailers only within an 80km radius of your dealership's location. "Price Match" does not apply to advertising errors or misprints, Boxing Day prices, special educational prices, restricted offers, mail order offers, rebates, coupons, premiums, free or bonus offers, limited or minimum quantity or limited time offers, close-outs, liquidations, clearances, and financing offers. Offer does not apply to advertised prices or internet quotes from outside Canada, online only stores, or handwritten or verbal estimates/quotes. Subject to stock availability. Advertised item must be an in-stock brand sold by the Toyota Tire Centre and be the same size, model, sidewall, speed and load rating. Qualifying tires must be purchased and installed at a participating Toyota dealer in Canada. Spring Wheel Alignment *Get wheel alignment for only $132.95+HST from April 1st to May 31st. Not valid in conjunction with other specials, tires services, express lube oil changes, rust inspections, Ontario Drive Clean, senior discounts & over the counter part sales. Price does not include replacement/installation of any damaged or worn parts. Offer Applicable on all makes and models. See Don Valley North Toyota for more details. Complimentary Wiper inserts & Washer fluid Offer *Offers are subject to change or cancellation without notice. From April 1st to May 31st, receive complimentary OEM wiper inserts with jug of washer fluid (regularly priced at $36.75+ HST installed) Not applicable with aftermarket wiper blade when you book a scheduled maintenance service. See Don Valley North Toyota for more details. "Getaway Inspection" Special *Getaway inspection package offer is available for Toyota or Scion vehicles only. Offer includes battery test, brake inspection, suspension components, top up all fluids, road-test for noise/alignment check, tire pressure check, inspection of all exterior lights, tires, pressures and filters in conjunction with a basic oil-change purchase for only $64.50+HST. Not valid in conjunction with any other specials offers, tires services, rust inspections, Ontario Drive Clean, senior discounts & over the counter part sales. Additional work may be performed upon owner's request and charges will apply accordingly. Offer expires May 31st . Please see Don Valley North Toyota service department for more details. HVAC Deodorize Special - $25 Off *HVAC Deodorize Special $25 off till July 31, 2018. Cannot be combined with Seniors Discount, any other discount or special offer. Does not include damaged, worn, or replacement parts. Toyota or Scion vehicles only. Savings will be applied before HST on final Service RO subtotal. Offers subject to change or cancellation without notice. See Don Valley North Toyota for full details. Save $50.00 off Brake Service *Complete a brake service with your maintenance appointment and save up to $50.00 on any paid service or maintenance service before July 31st, 2018. Applicable to 2016 and newer Toyota models on maintenance service package 2 and 3. On 2015 and older, only applicable to maintenance service package 1. Cannot be combined with Seniors Discount, any other discount or special offer. Does not include damaged, worn, or replacement parts. Toyota and Scion vehicles only. Savings will be applied before HST on final Service RO subtotal. Offers subject to change or cancellation without notice. See Don Valley North Toyota and Scion for full details. EFI/Throttle Cleaning Service - Save $50.00 *Receive $50 off when you book a fuel injection/throttle cleaning service with Don Valley North Toyota. Cannot be combined with Seniors Discount, any other discount or special offer. Does not include damaged, worn, or replacement parts. Toyota and Scion vehicles only. Savings will be applied before HST on final Service RO subtotal. Offer expires July 31st, 2018. See Don Valley North Toyota for full details. Back to School Value Package *Back to School Value package offer is available for Toyota or Scion vehicles only. Offer includes battery test, brake inspection, suspension components, top up all fluids, road-test for noise/alignment check, tire pressure check, inspection of all exterior lights, tires, pressures and filters for only 64.50+HST. Not valid in conjunction with any other specials offers, tires services, rust inspections, Ontario Drive Clean, senior discounts & over the counter part sales. Additional work may be performed upon owner's request and charges will apply accordingly. Complimentary wireless speaker (Value of $29.95) is only valid in conjunction with an oil change purchase. Offer expires September 30th. Please see Don Valley North Toyota service department for more details. Brake Fluid Exchange Special *Brake Fluid Exchange (recommended every 48,000 kms) now offered for $158.35+HST. Cannot be combined with Seniors Discount, any other discount or special offer. Does not include damaged, worn, or replacement parts. Toyota or Scion vehicles only. Savings will be applied before HST on final Service RO subtotal. Offer expires September 31, 2018. See Don Valley North Toyota for full details. Complimentary season of Tire Storage when you pre-order winter tires *Complimentary tire storage up to 6 months (valued at $99.95+HST) provided on the purchase of a set of winter tires from Don Valley North Toyota. Price of Tires vary by make and model. Offer valid 6 months from the date of purchase. Not valid in conjunction with other coupons, promotions or discounts. See Don Valley North Toyota for more details. Pre-Order winter tire package & receive complimentary season of Tire Storage *Complimentary tire storage up to 6 months (valued at $99.95+HST) provided on the purchase of a set of winter tires from Don Valley North Toyota. Offer valid 6 months from the date of purchase. Not valid in conjunction with other coupons, promotions or discounts. Applicable to Toyota and Scion only. Offer expires October 31, 2018. See Don Valley North Toyota for more details. Winter Ready Package *Retail price of cargo liner and floor liners vary by year and model. Receive a complimentary WWAF (Windshield Washer Anti-Freeze) and a snowbrush when you purchase cargo liner AND floor liner for your Toyota or Scion vehicle. Not valid in conjunction with other coupons, promotions or discounts. Applicable to Toyota and Scion only. Offer expires December 31, 2018. See Don Valley North Toyota for more details.